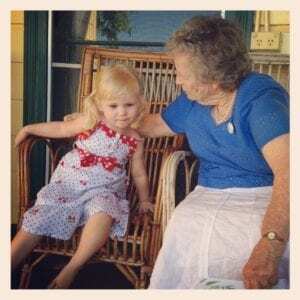 My mother and grandmother spent many a weekend patiently explaining the basics of cross stitch, applique, knitting and crochet to us when we were younger. I can’t say I do any of these things now, but I know the basics and will go back to them one day when I have more than two seconds spare time. My current modus operandi is to smile sweetly at my nan and ask her to whip up all the sewing and knitting projects I find. 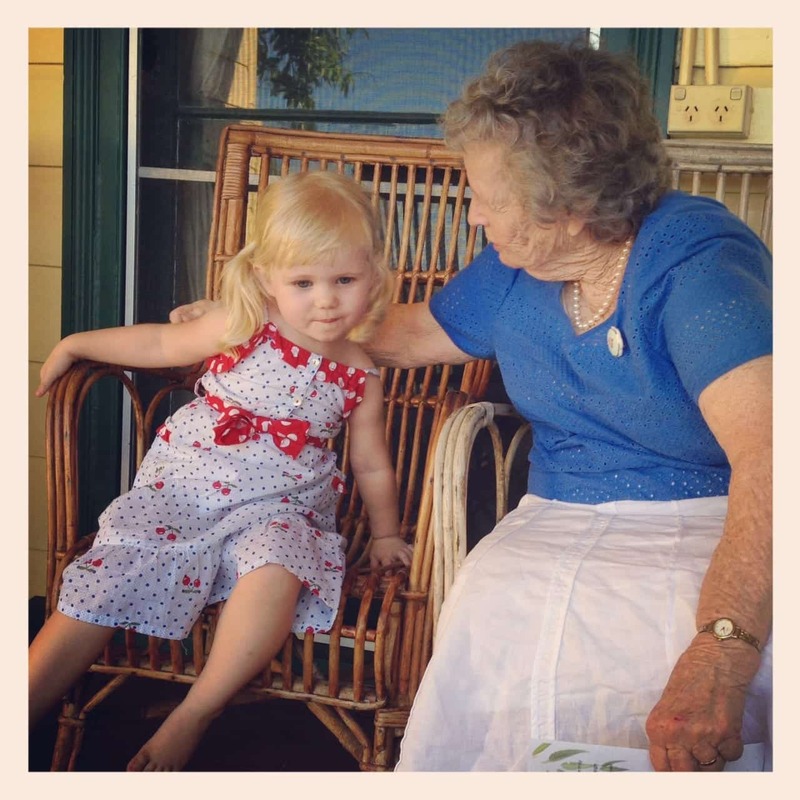 I regularly buy patterns online from etsy and the like and drop them over to nan. It’s like magic; I drop a pattern over, she returns a completed item the following week – often with a number of frozen meals she’s whipped up for us and all our ironing. She’s a wonder that woman! I know the smart thing would be for me to learn from her and become a master stitcher myself – but I just adore looking at the neat stack of crocheted blankets she has made for me since childhood, and the ones she now makes for my children, her great grandchildren. 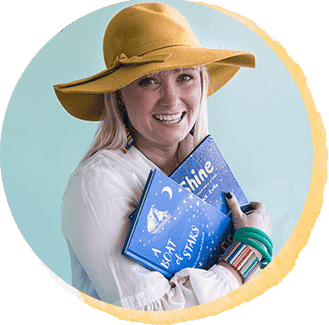 She has a great sense of colour and design and there is no chance that any of her sewing or stitching projects look dated – they are timeless and cherished. The three older children in our extended family (5, 7 and 8 years) are all keen to sit with their great grandmother and stitch away. It’s a nice quiet activity for them to do with her after a morning of tearing around the house and garden like mad things. Nan’s five great grandchildren (all girls!) adore her – and not just because she always arrives with a bag of treats. Although there was that time that we pulled up at her house and Pud (two at the time) shrieked “the house of tweets (treats)!” before crying with excitement. Anyway, back to the sewing! Part Two of this post is here! 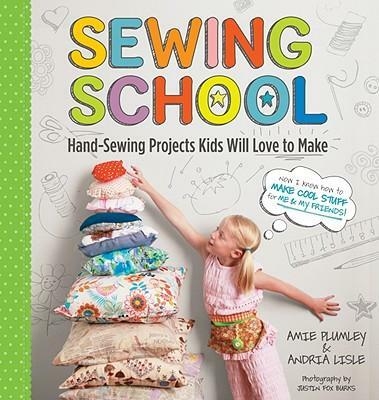 When I was younger I adored looking at the projects in sewing and craft books and I’ve started to amass a collection for all the children in our extended family – and nan regularly adds to the collection. In my school library, the craft and sewing sections of non-fiction are some of the most popular books, especially for school holiday borrowing. It’s nice to encourage children to choose their own holiday project from a book. 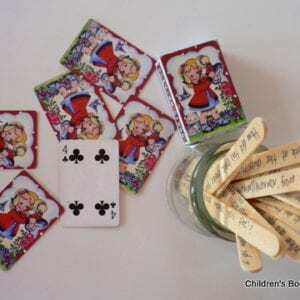 Following instructions for a project is a great purposeful reading activity. 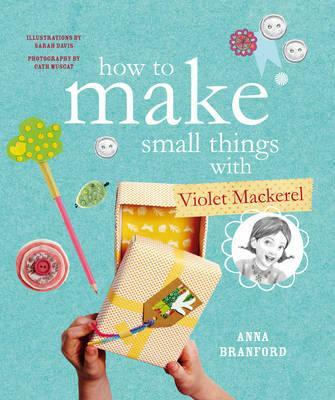 My favourite crafting books at the moment ‘Lazing on a Sunday Crafternoon’ which I spoke about here and ‘How to Make Small Things with Violet Mackerel’ which I spoke about here. 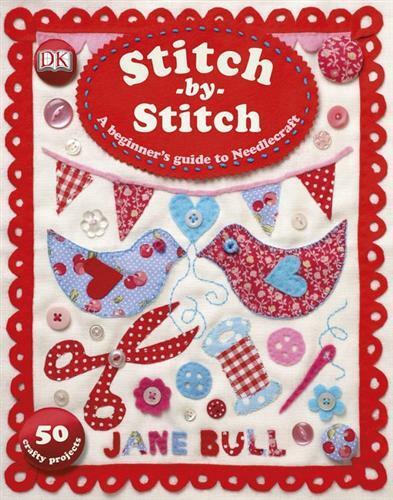 Stitching seems high on the agenda at the moment so we’ve made some stitching kits and started learning the basics. The boxes are deliberately small so that they are portable between houses and activities. If any of them show a keen interest we may go bigger for one of the birthdays. Each kit contains plastic needles, different ply’s and colours of wool, threading shoelaces, beads, buttons, plastic canvas, fabric canvas and felt. 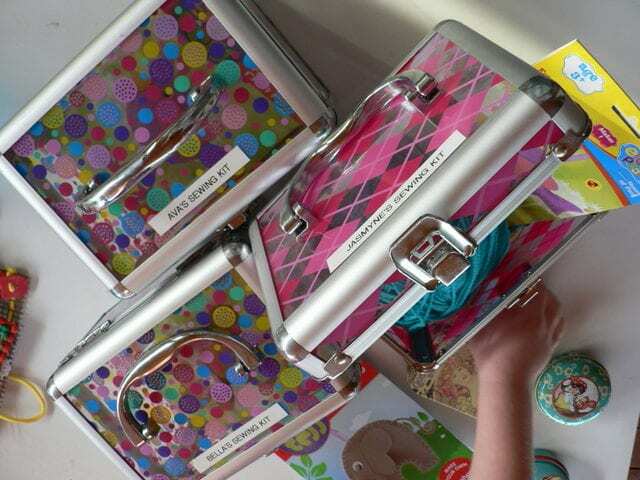 We also added a simple sewing kit each, which we picked up at Spotlight. I’ve spoken before about craft kits and why I like them here. Nan and I trawled the craft shops around her house for all the items to go into these kits. I have an ever growing collection of cute tins and I added a few of these to each kit to organise the smaller items. The round tins are from Lark and they are just perfect for holding buttons and beads. 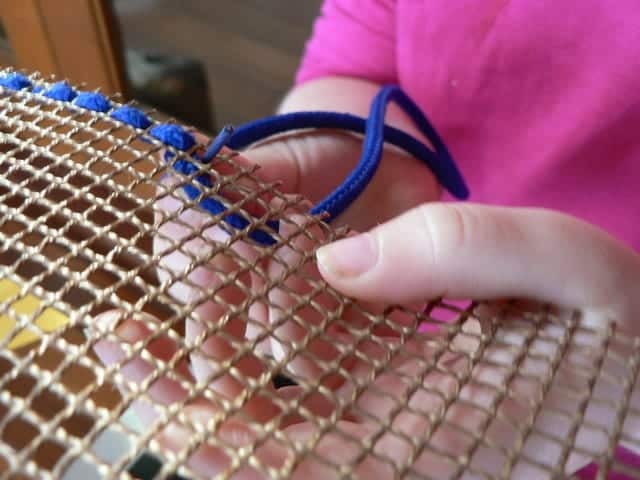 Plastic canvas with an open weave is easiest for beginners. They can practice their stitches, sew on a few buttons and have success right away; which will encourage them to try more difficult projects. 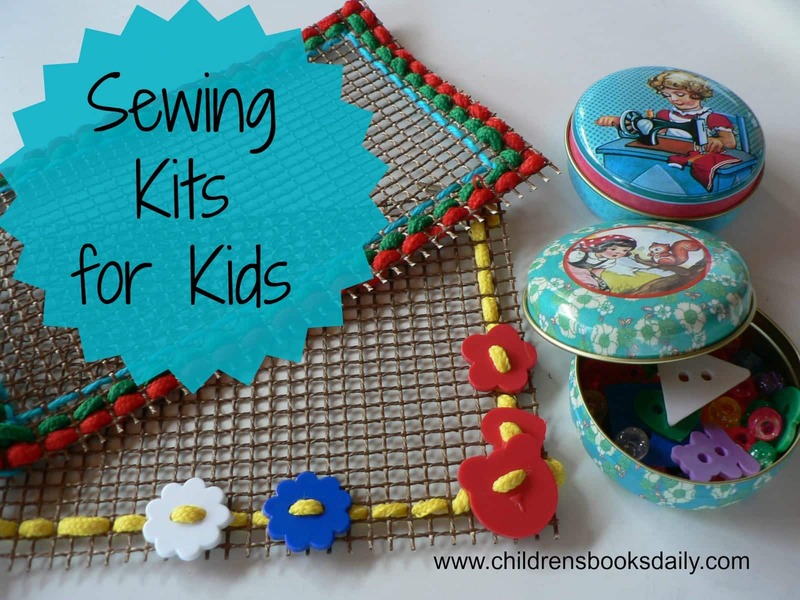 A sewing kit and a sewing project book makes the perfect gift for a child over the age of about five. 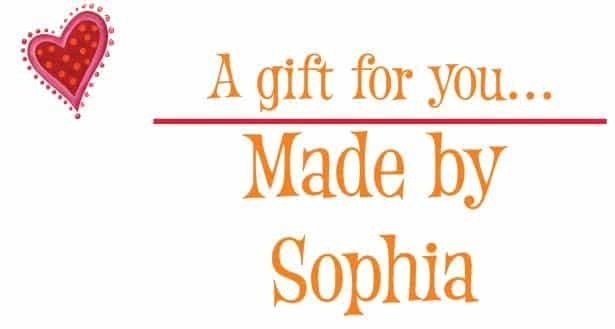 When we’ve given kits as gifts, I also get small ‘Made by’ stickers from Vistaprint, some examples of recent ones I’ve done are below (not to scale…these are a return address label size). These are a huge hit and are soooo inexpensive. PudStar has a set of these stickers and on what she deems her best artworks and project, a sticker is added. Last year I worked out the main birthday gifts we would need to buy for a few months and did an order of ‘Made by…’ stickers so I was kind of organised. I use the address labels here. Don’t be fooled by this forethought…my life is a picture of chaos. These books can be purchased by clicking on the covers. 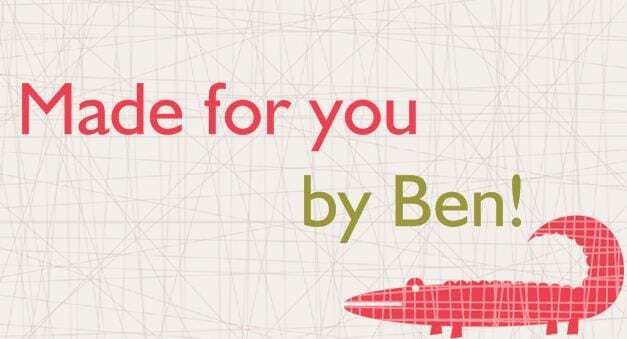 The cover images take you to the Australian based online bookstore Booktopia. If you live in the US or would prefer to use Amazon click here. If you live in the UK or would prefer to use Book Depository click here. 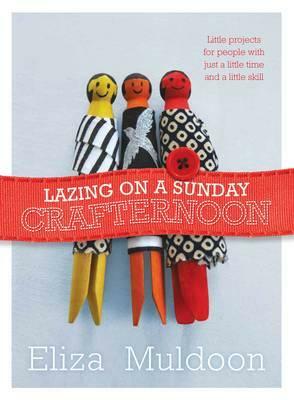 ‘Lazing on a Sunday Crafternoon’ is not exclusively sewing projects, but does have some excellent ones. You can read my full review of this title here. 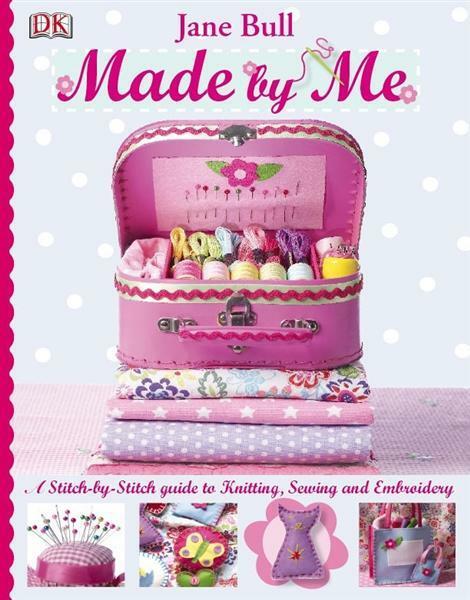 Again, not exclusively sewing…but oh my GLORY this book is amazing and you can read my full review here. Thank you nan! We all adore you! Just regarding your sewing kits. Have you self assembled these from bits and bobs or did you buy a premade kit? I sent you an email with details of how I put the kit together, I hope you got this? I’m SO pleased you commented! Made my day! This is an absolutely wonderful idea. I have been asked to teach a few young girls how to sew. I think I will follow your lead and start with a basic sewing kit. The girls just want to head straight to the machine but I want to teach them basics of hand sewing too. Any ideas that you can give would be appreciated. 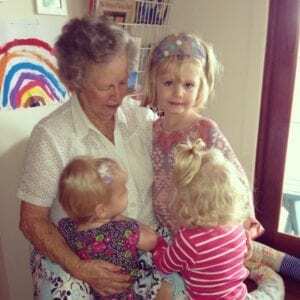 Hi Monica – yes our girls still love these kits, they’ve been great! I’d say start with hand stitching myself – lots of in and out with the meshy stuff you can see in my photographs, and sewing on plastic buttons and the like. 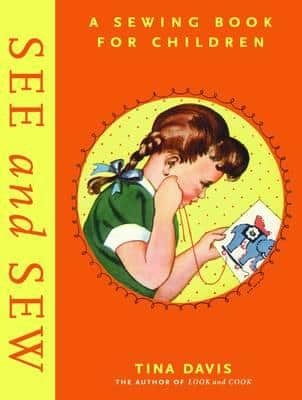 A few of the books I talk about have really simple sewing activities which are great for beginners…things like felt Christmas ornaments sewn together and stuffed with stuffing. Lots of threading is also great. Hope this helps! I love these kits . How fun for the beginners. Can you provide a list of things that go in your kit? Perhaps I should look at some of those books for ME – hubby is the sewer in our house, I’m hopeless! Stick with hubby being the sewer- that is AWESOME! Lovely. I remember looking through pattern books, then picking materials then having my mother pin hems as I stood on a chair. 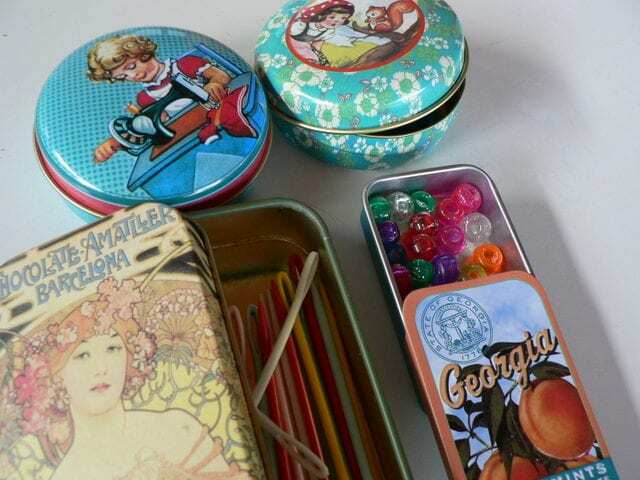 Love the personal sewing kits, and the vintage style tins, LOVE! I remember those times too Kate – and getting pins stuck IN me! She is indeed a gem and we’re very lucky to have her! I love the sewing kits, what a brilliant idea! I have many lovely memories with my Mum and Nan learning to sew, crochet and knit. They are such wonderful skills to pass on to our kids.